How did I miss May? 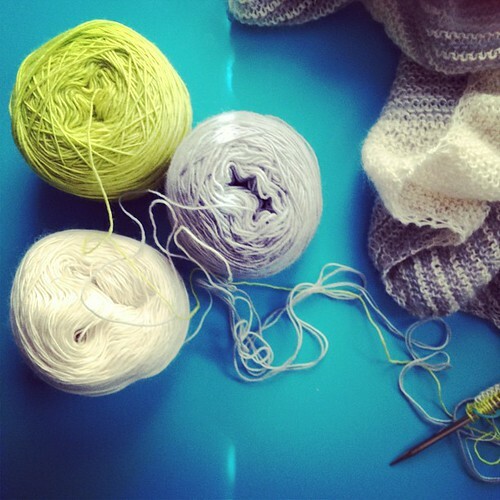 June 4, 2012 June 4, 2012 | katie m.
At least knitting is going according to plan. This is Veera’s lovely Color Affection shawl in three shades of malabrigo lace: natural, polar morn, and apple green. So far, it’s fluffy soft and light as a feather … though a bit tangly, keeping all those fuzzy strands in order. The rows have gotten long, but that’s okay. It’s summertime in Nashville, so there’s no hurry … though I have to say, my giant Leaves of Grass is an ideal café companion: it’s basically a blanket, perfect for wrapping up against overzealous air-conditioning. Then there’s Alice … enjoying some mint chocolate chip. Weirdo. Posted in bloggy business, knitting, stripes! OMG I love this. It is going to be AMAZING. GORGEOUS! I love those colors, and I’m tempted to cast on myself. Must finish Tardis shawlette first, though. Love your color choice. It’s so fun seeing all the combinations people are coming up with for this shawl. 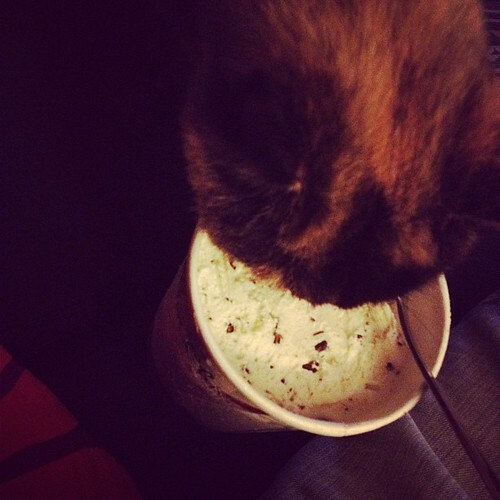 And my kitty likes ice cream too. Can’t believe it’s nearly July, either 🙂 Nice colours, that shawl is on my list!